NormSoft make an iPhone/iPad universal app called Pocket Tunes Radio that sells for $6.99 and lets you browse and listen to thousands of local and internet radio stations as well as podcasts. If you ever plan on listening to anything on the radio or streaming some podcasts to your iPhone or iPad, Pocket Tunes Radio is the app to get and although a bit on the pricey side is well worth the investment. The app uses your GPS and finds all the local radio stations in your area automatically. It was able to find over 80 local radio stations in the Greater Los Angeles area alone, and to make things simple the results are sorted by category and can be searched by keyword to find exactly what you need in no time. Adding your favorites for quick loading later is a snap. When you open the Pocket Tunes app, it automatically starts playing your previously used station. 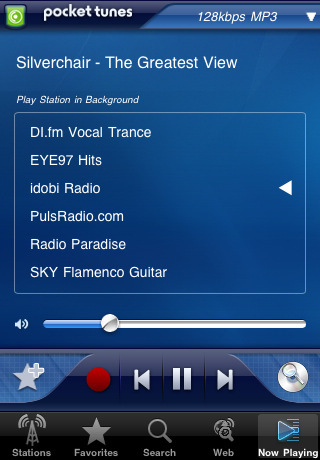 In addition to the local stations you can browse and discover stations by country and genre. XM subscribers can stream those stations too. The app lets you record live stations. 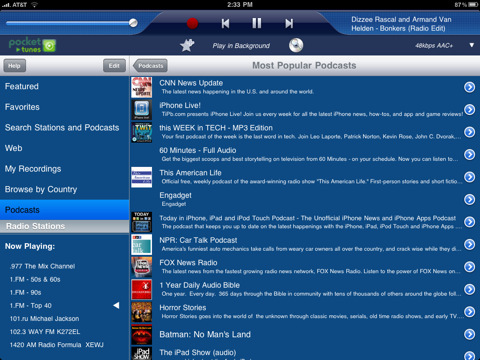 Finding podcasts in the latest version of Pocket Tunes is simple. YOu can look for popular podcasts, recently added ones, search for them by keyword or browse by category. Once you find good ones you like, you can subscribe to them in Pocket Tunes and the app downloads Episodes to your device for offline listening. If you don’t care to download the, you can always just stream the podcast episodes on demand. – Background playback – multitasking feature is now built in! Overall, Pocket Tunes Radio is an all-in-one app for radio and podcasts that works on both iPhone and iPad. The user interface can use some freshening up, though the functionality is flawless and is overall a great investment. AppSafari review of Pocket Tunes Radio was written by Joe Seifi on August 29th, 2010 and categorized under App Store, Featured, Fun, iPad apps, Local, Music, Radio, Universal. Page viewed 5807 times, 1 so far today. Need help on using these apps? Please read the Help Page.